Going to uni, whether it’s close or far away from where you live, can be a scary and confusing experience. 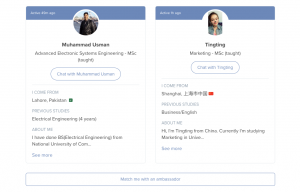 The University is trying to make the process a bit easier by having Unibuddies. What is a Unibuddy? They are students that have signed up to be available to get questions from people who are thinking of coming to Kent. What’s the weather like? How are your lecturers? As an international student what was the hardest thing to get used to? Since April 2018, 1870 questions like these have been answered by our students. Interested? You can fill out this online application.